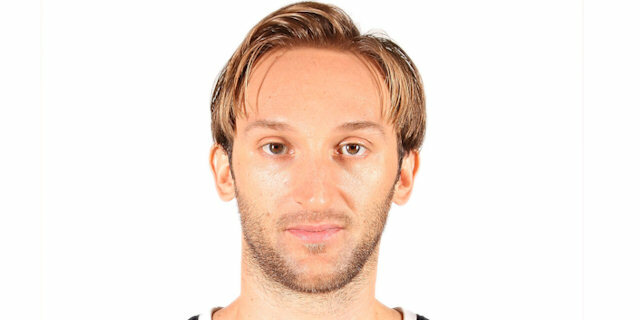 In one of the greatest finishes in professional basketball history, Zoran Planinic banked in a three-quarter court prayer as time expired to lift Anadolu Efes Isatnbul to a 61-60 victory over EA7 Emporio Armani Milan on Friday night at Abdi Ipekci Arena. The victory was the first for the host team in the Top 16, while Milan fell to 2-2 in Group E. The visitors led most of the game before Dusko Savanovic scored 9 points in 17-2 run that bridged the third and fourth quarter. However Milan rallied late and regained the lead on Daniel Hackett’s free throw with 11.5 seconds remaining. The game appeared to be in Milan’s pocket after Savanovic missed a three, but Planinic had other ideas. 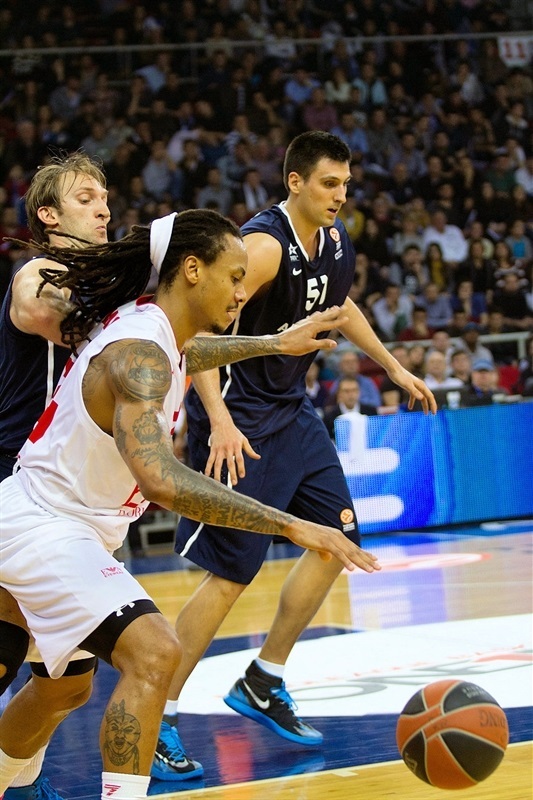 Savanovic finished with 13 points and 6 boards for Efes. 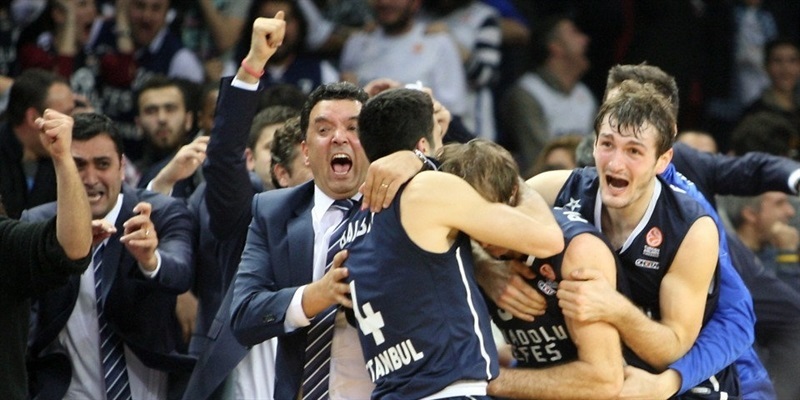 Planinic scored 8, while Kerem Gonlum made history with 6 points and 14 rebounds. He recorded his 1,000th career rebound in the second quarter and finished with 8 offensive boards, which is second most in club history. Keith Langford, whose missed foul shot allowed Planinic to win it, led Milan with 18 points. Gonlum crashed the offensive boards to score the first basket of the game. 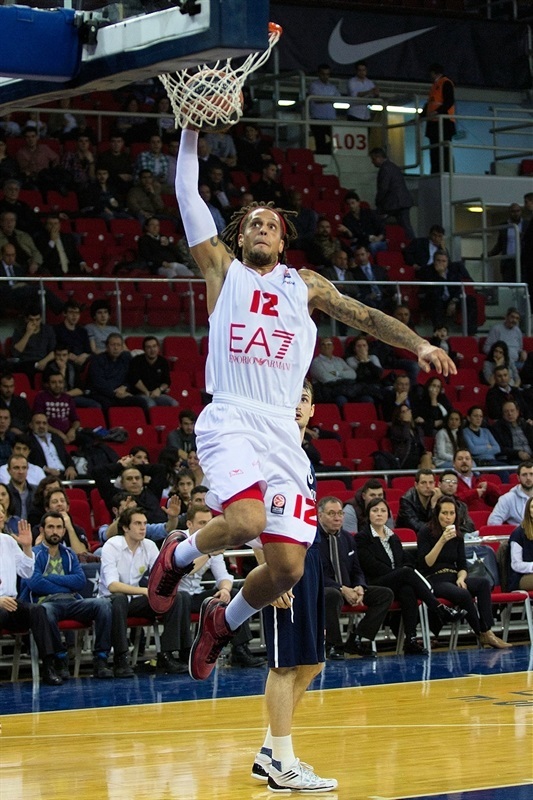 Samardo Samuels scored under the basket for Milan’s first basket. Milko Bjelica put the hosts up 4 before Samuels’s second basket. Nicolo Melli tipped in his own miss to tie it, but Kostas Vasileiadis answered with a triple. Langord got on the scoreboard for Milan before an Alessandro Gentile triple gave the visitors their first lead, 9-11. Efes kept struggling to score and tried to change things by bringing Savanovic and Planinic off the bench. Dogus Balbay took over with a driving layup which ended a three-minute scoring drought for the hosts and tied it. Langford free throws restored Milan’s lead, but a Birkan Batuk triple changed that. Samuels remained a factor inside with two more baskets to help the visitors take a 14-17 lead. 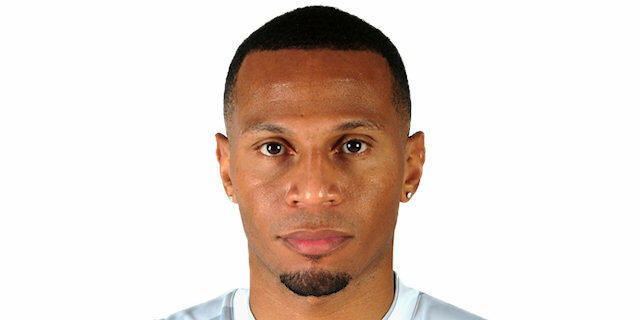 After two scoreless minutes, David Moss found an open Curtis Jerrells for a three-pointer. Jerrells connected again from downtown on the next possession. The guard made it 8 straight points with a layup in transition for a 10-point Milan lead. Gonlum ended the Efes dry spell with an impressive follow-slam for his 1,000th career rebound. Dogus Balbay’s basket was followed by a Vasileiadis three to make it 22-25 midway through the quarter. A Milan timeout changed little as Vasileiadis drained a long jumper. 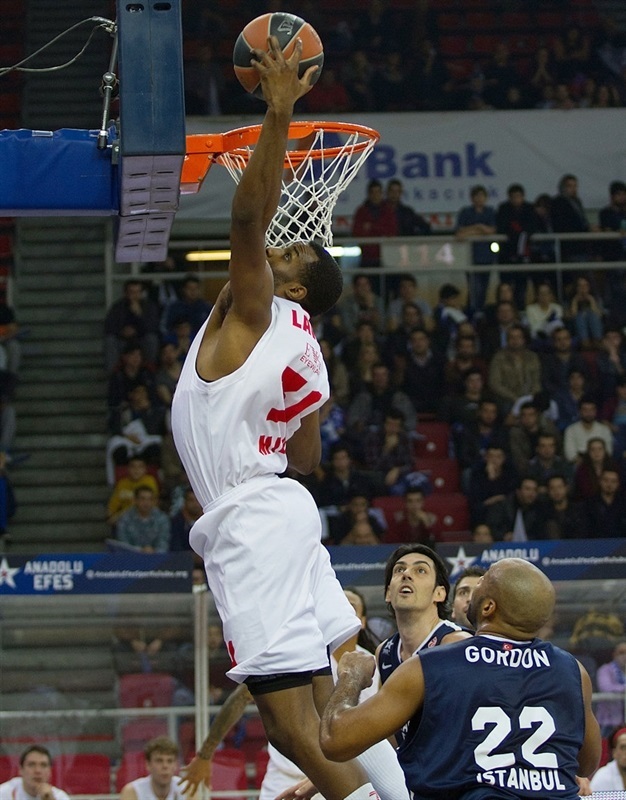 Langford ended the Efes run at 9-0 with a layup on the break. Moss sank a three to restore a comfortable 24-30 cushion. 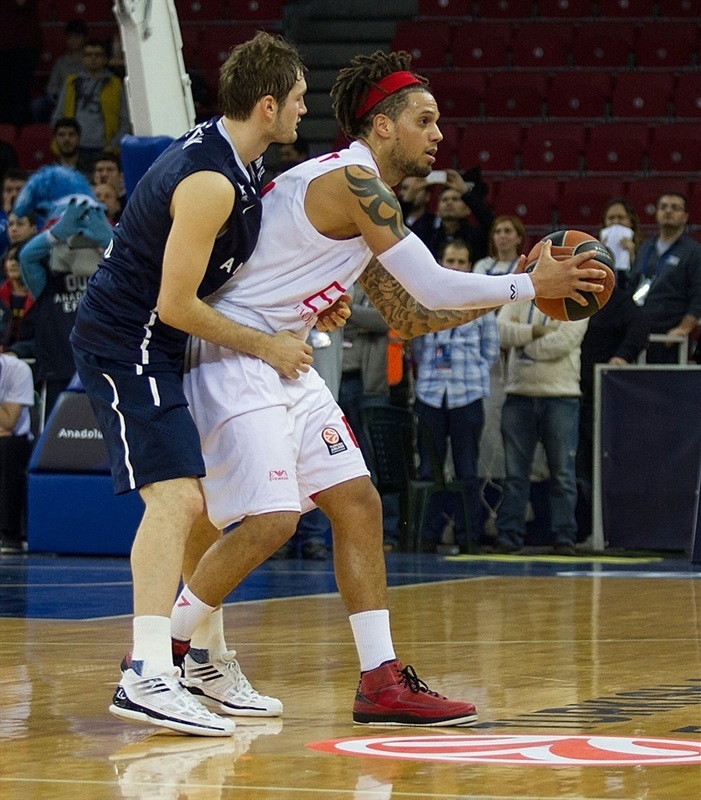 Daniel Hackett added free throws before Milko Bjelica muscled his way to a basket. Batuk and Langford traded points before Zoran Planinic fed Bjelica for a baseline jumper at the halftime buzzer to make it 30-34. Melli opened the second half with a three-pointer. Savanovic heated up with his first basket on the break and a little later a jumper, but Langford scored in between. Langford put milan up 34-41 midway through the quarter. After the TV timeout, Langford’s steal led to a Gentile layup. Savanovic sank a jumper from close range and Balbay dunked on the break to keep Efes in the picture. Melli’s put back kept Milan ahead, 38-45, but Planinic responded with a triple and then drove and dished to Savanovic to close the gap to 43-45, which is where it stood at the end of the quarter. 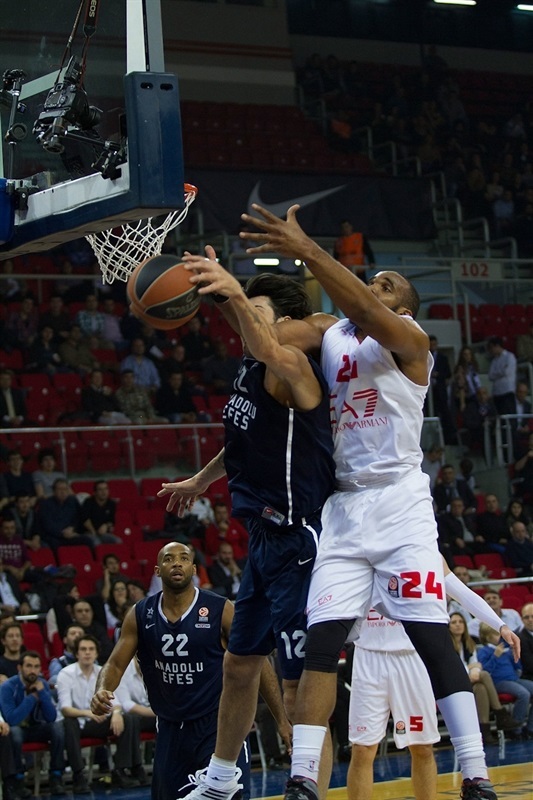 Balbay tied the game and Bjelica gave Efes its first lead since the first quarter with a pair of free throws. Savanovic tacked on 2 more free throws and drove through C.J. Wallace to cap a 17-2 run that made it 51-45. Langford went to the rim for a basket plus foul, however Batuk kept the pressure on with a score. Langford responded with a clutch three to bring Milan back within 3 midway through the quarter. A rebound and long pass from Savanovic set up Planinic for a layup. 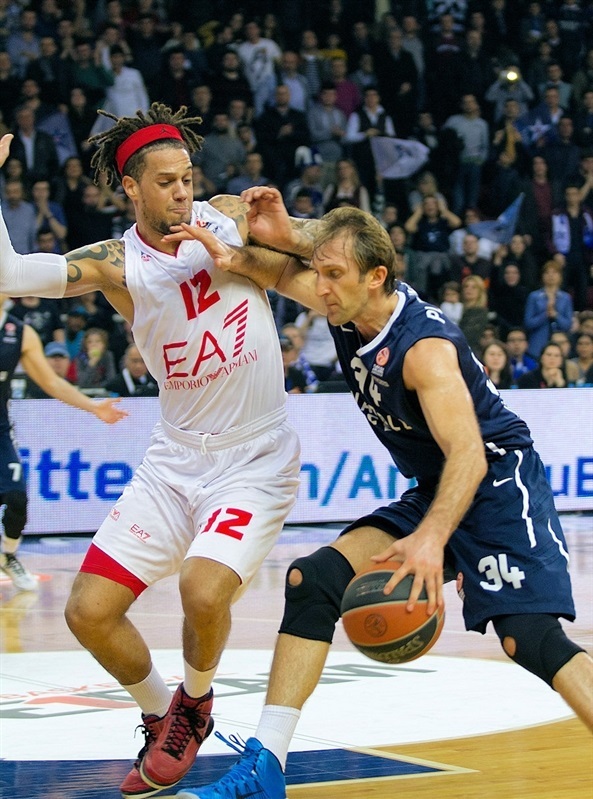 Kristjan Kangur fouled out and Bjelica split the corresponding free throws to make it 56-50. Melli and Savanovic each missed free throws to keep the score the same. Wallace closed the gap to 4 from the line with 1:44 to play. After Milan’s pressure forced a 24-second violation, Wallace breathed new life into the game with a three-pointer. Wallace rejected Savanovic and Hackett completed the comeback with a three-pointer, 56-58, with 27.3 seconds remaining. Vasileadis missed from deep, but a tip-in by Gonlum tied the game with 12.5 seconds left. Batuk fouled hacket, who split free throws with 11.5 seconds remaining. Efes called timeout to design a final play. 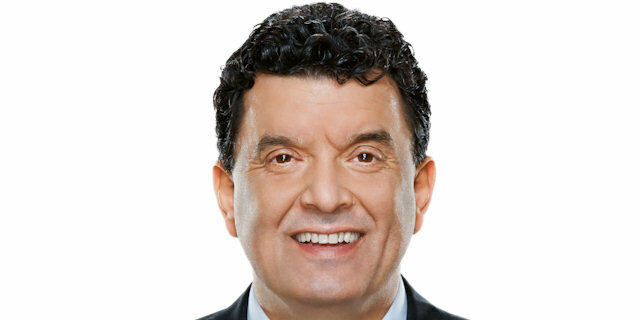 Savanovic missed the potential game-winner. Efes sent Langford to the line with 3.2 seconds remaining. He made the first, but missed the second. 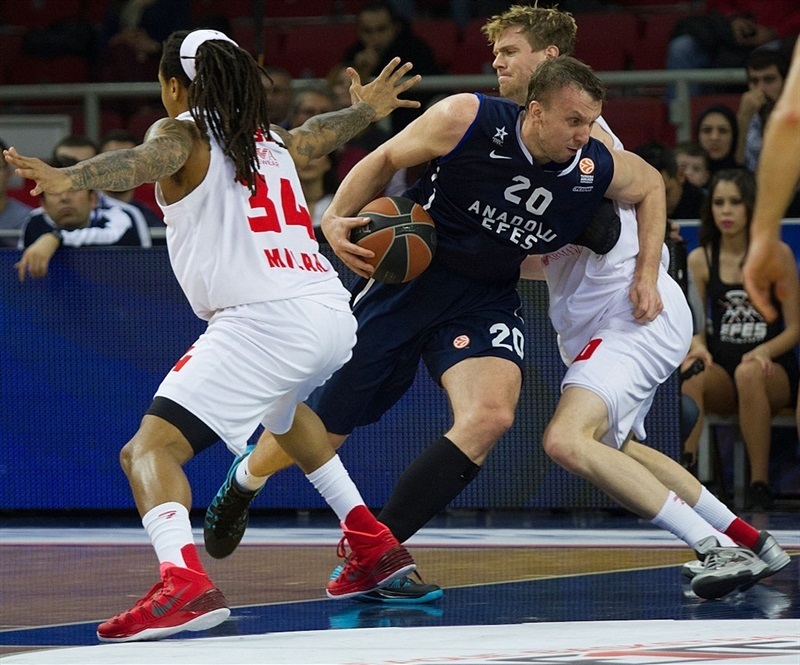 Planinic grabbed the rebound and heaved a three-quarters court prayer that was answered – off the glass – to give Efes a remarkable win. "First of all I want to congratulate my players for their great effort to win the game. They really competed at a top level. Some people can say that it’s luck for the Planinic shot. But even if we lost the game I would have said the same thing, that we are successful. We were great in defense. Now we have a long way until the end of Top 16. We have to forget about this win soon and look forward." "The reason we lost the game is just a rebound in the last second. 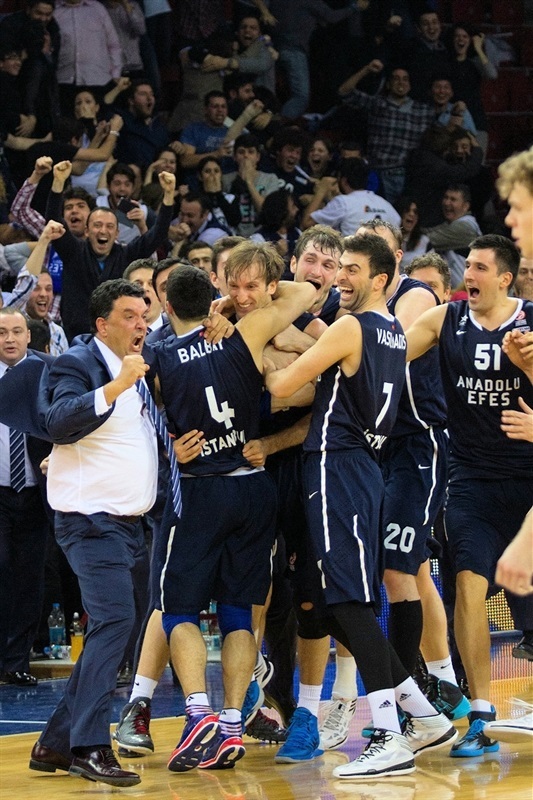 We knew that Anadolu Efes was going to try everything to win. We had a good first half but I cannot say the same for the second half. We couldn’t challenge as much as our opponent. We made some mistakes on offense, especially with our shot selection. 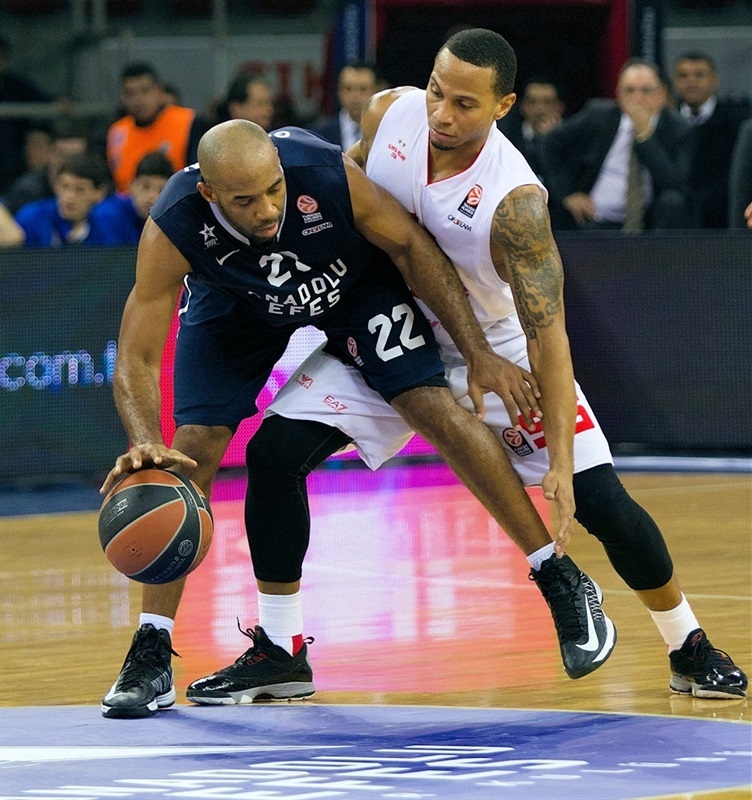 I congratulate Efes for their win." "It’s not a strange thing for me to make this kind of shot. I also did it before in my career. When I had the rebound I only thought about shooting the ball to the basket soon. I turned around and threw the ball. Thank God it went in. I’m happy to help my team to win. I hope this shot changes things both for me and for Efes." 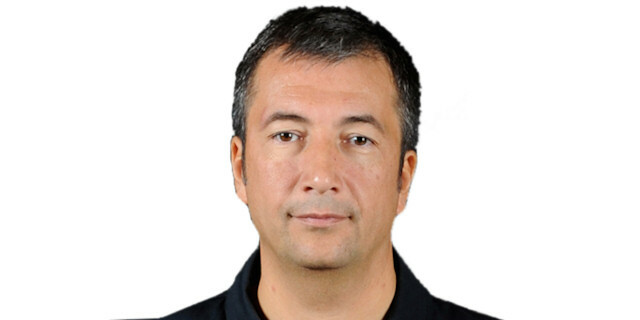 "Anadolu Efes played a great defensive game. They hustled really hard and things went wrong in offense. We had the chance to win the game. But Zoran Planinic did the impossible to score from long distance in the end. Nothing we can do. Congratulations to Anadolu Efes."